Total Basement Finishing introduces Basement to Beautiful Wall Panels, our brand new basement wall insulation product for cold, damp, unforgiving basement walls. Basement to Beautiful basement insulation panels are made with graphite-infused foam board. The graphite increases the R-Value per inch of the foam. The panels provide R-13 insulation value, which is the recommended R-Value for basement insulation in most areas of the country. Like all the other Total Basement Finishing wall products, Basement to Beautiful Panels are also 100% waterproof, mold resistant, and designed to act as a vapor barrier, keeping the moisture in damp concrete walls from evaporating into the basement. 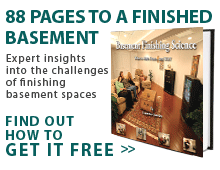 With Basement to Beautiful, you can insulate your entire basement without the need for framing. They are attached directly to the basement wall. Basement to Beautiful panels have embedded metal strips to hang finishing boards or drywall. When you combine Basement to Beautiful insulation panels with Total Basement Finishing cement core wall finishing boards, you will have a finished basement that will last for as long as your house stands. Unlike drywall, our cement core finishing boards are 100% waterproof and will not be damaged or support mold growth. They are designed to withstand the harshest moisture conditions, including basement floods and water accidents. They are also sturdy enough to support the weight of book shelves, flat screen TV's, and other fixtures hanging directly on them. The vinyl surface is easy to clean and maintain. With Total Basement Finishing products, you can build beautiful, energy-efficient finished basement rooms that your family will enjoy for many years to come! Contact us for a Free Design Consultation!